In the worst of times, often the best, most noble spirits, rise to the occasion. Such was the case after the Haiti earthquake of 12 January, 2010. 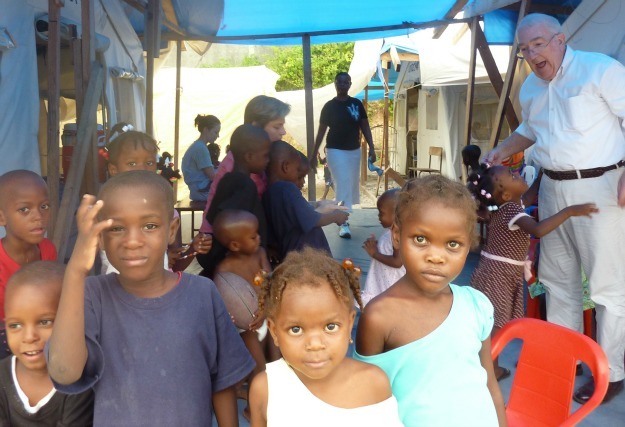 In Port au Prince and in areas around the capital, everyone was impacted. Everyone suffered a loss. Some were affected very directly, as they suffered the loss of lives of family members. Other suffered the loss of property and livelihoods. As one thinks back to the news reports during the earthquake, there were numerous stories about injury and damage – and indeed there was much destruction. Fewer stories appeared about the noble and selfless individuals who responded to the crisis, even amidst their own trauma and suffering. During crises, local staffs of church organisations involved in humanitarian assistance and international development, such as members of the Caritas network, are often not given the luxury of pausing to grieve or understand their own trauma. They must respond immediately to the tragedy. They are heroes whose first concern is to help the local communities survive and rebuild. I saw many examples of this when I visited Haiti in the earthquake’s aftermath to see firsthand the assistance Catholic Relief Services and other members of the Caritas network and church were providing. On Wednesday morning, 13 January, fewer than 12 hours after the first tremors were felt, Dr. Jude Marie Banatte, the director of the Catholic Relief Services office in the Southern town of Les Cayes, took it upon himself and his staff to load up a dozen trucks with food and supplies. His convoy was headed up to Port Au Prince as he expected the needs would be enormous there and the staff most likely traumatised. Amid the morning chaos of the 13th they brought a glimmer of hope to a bleak situation where the dust had not yet settled and aftershocks were felt throughout the day. Another selfless effort was exhibited by the Apostolic Nuncio, Archbishop Bernardito Auza. As the darkness set in on the night of the 12th in Port au Prince, he left his residence in search of the archbishop of Port Au Prince and other church members whom he had been unable to contact. Sometime in the early morning, amidst the still crumbling walls of the cathedral and the Archbishop’s residence, he found the lifeless bodies of Archbishop Miot and his Vicar General. 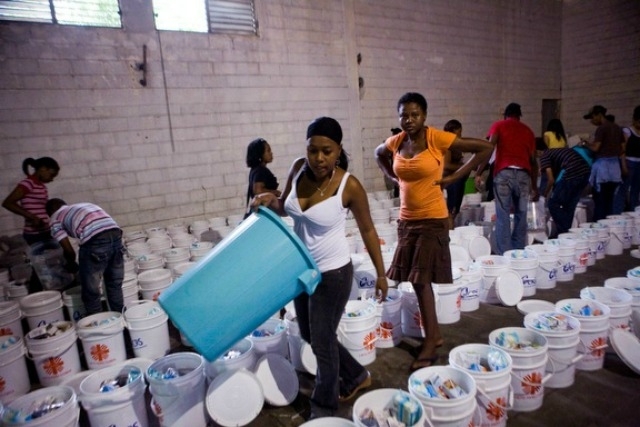 A symphony of clunks, clangs, and taps resonated in the Catholic Relief Services’ Dominican warehouse as dozens of volunteers dropped crackers, sardines, canned beans, juice boxes, and other food items into endless rows of white plastic buckets to donate. In the dimly lit but overflowing structure, Haitian university students worked side-by-side with local youth groups, former street children, and Catholic Relief Services and Caritas staff to prepare much needed food and hygiene kits for survivors. In the Caritas world there are many unsung heroes. Many who go about their services without applause, without TV interviews, or any other recognition. Those are the people who can be called great. Those are the people we remember six years on from the destruction in Haiti.